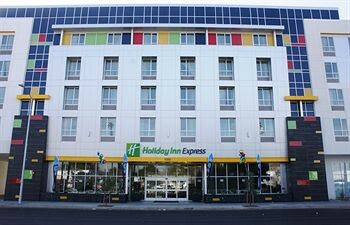 Property Location With a stay at Holiday Inn Express North Hollywood - Burbank Area in North Hollywood (San Fernando), you&apos;ll be close to CBS Studio Center and Universal Studios Hollywood®. This hotel is within close proximity of Warner Brothers Studio and NBC Studios.Rooms Make yourself at home in one of the 80 air-conditioned rooms featuring refrigerators and microwaves. Satellite programming and MP3 docking stations are provided for your entertainment, while complimentary wireless Internet access keeps you connected. Private bathrooms with shower/tub combinations feature complimentary toiletries and hair dryers. Conveniences include phones, as well as desks and complimentary newspapers.Rec, Spa, Premium Amenities Be sure to enjoy recreational amenities including an outdoor pool and a fitness center. Additional amenities include complimentary wireless Internet access and tour/ticket assistance.Dining A complimentary buffet breakfast is served daily.Business, Other Amenities Featured amenities include dry cleaning/laundry services, a safe deposit box at the front desk, and ATM/banking services. Self parking (subject to charges) is available onsite.